Hello all! Welcome to the March edition of the Catholic Book Club. 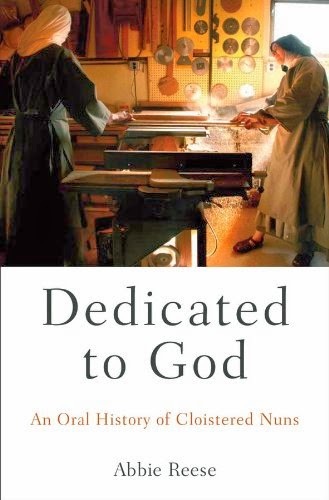 Today I'm reviewing Dedicated to God: An Oral History of Cloistered Nuns, by Abbie Reese. Having considered a vocation to the religious life myself, I have a huge soft spot for nuns. A life of community with a constant focus on prayer really appeals to me. Like any vocation, it would have its challenges, but this life seems so beautiful to me. Even though I was not called to this vocation, a piece of my heart will always belong to the religious life. "The Call." A discussion of discernment and the decision to come to the monastery. The nature of community life, and the struggle of some nuns to adapt to cloistered life. "The Life." A more in-depth look at the day-to-day life of the community and how many of the nuns have adjusted to, and contribute to, it. There are also stories in this section of the suffering some nuns experienced through health concerns. "The Threats." Stories of why some nuns almost didn't make it to the monastery, and how our modern secular culture no longer encourages religious vocations. I am a huge memoir fan, I adore personal stories, and this book was abundant in them. I LOVED that about this book. I enjoyed every single story of a regular girl going about her everyday life, when suddenly...wham! Something happens, and she feels called by God to give of herself in this extraordinary way. There are also lovely black and white photographs included in this book, which make the stories all the more poignant. The only thing I found difficult about this book was that I had a hard time keeping track of who was who and which nun was speaking at any given time. For each chapter, the author includes a general discussion, which will entail comments and stories from any number of nuns, and then switches gears to a longer longer story from a single nun. I found myself, especially at the beginning of the book, often confused about which nun I was currently reading about. It got easier towards the middle of the book as I started remembering names and placing them with identifying stories in my head. I enjoyed reading this book very much, and would recommend it to any of you who are as fascinated with religious life as I am. I found a copy at my library (as the print copy is a bit pricey in hardcover right now), I think it's popular in collection development right now because of the topic. The Kindle book is also priced well at $13.49. Check it out! Has anyone else read this book? Leave your thoughts in the comments! In April, I'll be reading and reviewing More Catholic Than the Pope: An Inside Look at Extreme Traditionalism, by Patrick Madrid. Join me! That book sounds really interesting--I have a couple of college friends who went into cloisters. Tough on their families but I think they ended up very happy. April. . . I'll admit I have mixed feelings about Mr. Madrid in print. . . can't wait to see your review.